An overview & step-by-step tutorial emphasizing the practical aspects of communicating with APRS and E-mail in space. Necessary hardware & software that you need to make it work. Simple techniques that result in digipeating over thousands of miles. Prospective speakers may make a request to speak at an upcoming Amateur Radio Technology Day event using the form on this page. Get On The Air (GOTA) High Frequency Radio Station on Air All Day! Radio Station K6YA on air for 12 hours — An Exclusive Monthly Feature! 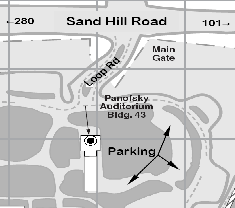 SLAC has graciously given us use of a large indoor and outdoor activity area, including a large auditorium and a picnic area to practice and demonstrate our amateur radio skills. We provide the space, a refrigerator and BBQ grills, but you provide the radios, antennas, and food for yourself. There are a few rules on what you can and can't bring please see the reverse side or our Web site for complete details.